However the situation in Burkina Faso is resolved, it is unlikely that the logic of the nation-state that guide African political formations will be questioned. The “instability” of African nations is not only the product of neo-colonial legacies; it is the product of the idea of the nation-state itself. That is, the nation-state—especially the former colonial ones—exists primarily to protect the sanctity of capital; they are fundamentally anti-human. That these constructs are unquestioned reveals the fallacies of any notion of a “postcolonial” moment when we consider that African ways of knowing have been effectively eliminated from ways of governing African people. The mind is still colonized; the “body” is only following. What the latest coup d’état—and its reversal—has offered us is an opportunity to think about human existence beyond the nation-state, beyond the imperial constructions of what is possible. It is significant that Burkina Faso, a country that was effectively re-imagined under Thomas Sankara’s anti-capitalist vision, stands at this moment in “crisis.” It is a crisis made possible by the betrayal of the deeper work of re-imagining began under Sankara. And it is also the crisis of Haiti, of Brazil, of South Africa and other African states. For it is the crisis of the idea of the state, and more concretely, it is a crisis of consciousness. African thinkers the world over are faced with the task of imagining new possibilities. What has become clear is that making what Mario Beatty has recently called the ideological rupture, though necessary, is not nearly enough. As Beatty claims, thinkers like Cheikh Anta Diop remind us that we must also break from the epistemological logics that have structured our misery; or Euro-modernity. That requires a fundamental rethinking of the supposedly self-evident idea that the nation-state is the logical form of political organization for the destruction of colonialism and for the remaking of our lives. And here is where Diop’s call for the restoration of historical memory becomes paramount. For Africans have created forms of human organization that preceded the notion of the nation-state and necessarily offer ways of imagining us out of the colonial and the neo-colonial. Notwithstanding the misguided debates about whether “precolonial” African societies were “stateless,” what is clear is that these formations did not mirror what exists today. While it may be true that we “can’t return home,” this is certainly not an excuse to accept the conditions of statehood that exist today as the only possible future. One of the clearest commentators on both the restoration of African historical consciousness and the imposition of Euro-modernity is Jacob Carruthers. In an essay entitled, “An Alternative to Political Science,” Carruthers reminds us, among other things, that the concept of “politics” informs the nature of the modern nation-state. And within its “nature” lies the kernel of inequality. But for African peoples, Carruthers argues, the wisdom of African governance might better guide our actions on our own behalf. As an Egyptologist who views the legacy of our ancestors as lessons for the present, the work of Carruthers as well as Diop show us that the past is not to be understood simply as an relic, an artifact for our museums. In the colonized mind, the perfection of the Western state model and its corollary, liberal democracy, is the best we can hope for and achieve (this explains the incorporation of indigenous models within the machinations of the state; much more might be said about the politics of these kind of usages of traditional power). However, with an historical consciousness that extends beyond Euro-modernity, we can see beyond these claims and better understand why its failures, its contradictions so consistently manifest themselves in our struggles to create a new world where Africans can flourish. In their stead and in the then (c. 1996) assumptions attached to the idea of the “withering of the nation-state,” Robinson offers the notion a “Pan-African commonwealth,” which would have at its core the sense that African humanity transcends the imperial borders of Euro-modernity and questions of human survival necessitate a structure that resists the logics of those borders. If the core of the militaristic, the fundamentalist, and the anti-human resistance movements which label themselves “anti-Western” is this misguided understanding of the state, then our energies might be more usefully spent engaging and supporting those movements which continue to approach the African future from the standpoint of decolonization. Achille Mbembe’s recent piece offers a genuine critique of the amorphous sorts of theorizing attached to the recent decolonization movement in South Africa and of the kinds of expressions of psychic release that often attend these moments. Yet it seems what is left undone is the kind of work that goes beyond the critique-of-the-critique model, which seems to envelop so much of postcolonial thought. Mbembe’s approach assumes “whiteness” is the origin and end of that which is to be grappled with. But what of the grounding philosophies that made possible the event of “whiteness”? Is the idea of “multiracial democracy” itself a product of these same philosophies? Though left largely unsaid, perhaps guiding Mbembe’s project is a desire to see a program of decolonization move Africa consciousness away from the very ideological and political strictures which made the dehumanization of Africans necessary. If this is so, the deep conceptual work of rethinking the state might be one of many new projects that would better position Africa to free itself from the sources of its colonialism. It seems implausible that aping the so-called Asian miracle of Malaysia and Singapore would get us to that point. The upshot—if there is one—is that we are in a position where our imaginations do not have to be limited to the philosophical and political visions of Otto von Bismarck, John Locke, or Thomas Jefferson. We now have thinkers able to access the knowledge necessary for reconnecting Africans to our own ancestral visions which might guide our own future possibilities, our own political formations, our freedom. What a time to be alive, indeed. 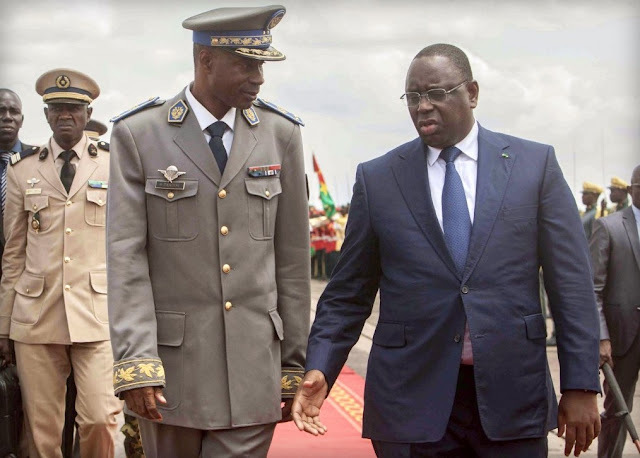 This article was first published at Pambazuka News on Sep 29,2015 / Image: Burkina Faso Gen. Gilbert Diendere, center, walks alongside Senegal President Macky Sall, right, after he arrived at the airport for talks in Ouagadougou via Washington Post. This essay appears in his Intellectual Warfare (1999). Cedric Robinson, “In Search of a Pan-African Commonwealth,” Social Identities 2 (1996): 165.